WASHINGTON – American Action Network’s Middle-Class Growth Initiative (MCGI) today released an animated digital ad campaign as part of its multi-million dollar effort to advocate for pro-growth tax reform. 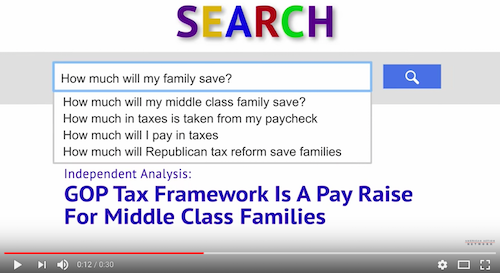 The ad simulates a search query on tax reform to highlight tax cuts for middle-class families under the Tax Reform Framework, according to findings from an independent analysis. The $500,000 digital campaign will run for two weeks on various digital platforms including YouTube, Facebook, and Twitter in 42 congressional districts nationwide. View the list of districts targeted here. American Action Network’s Middle-Class Growth Initiative is a special project launched in August to advance tax reform in Congress. The multi-pronged effort, now totaling over $10 million, has included advertising on television, radio, direct mail, digital platforms and mobile billboards in over 40 congressional districts nationwide. American Action Network's Middle-Class Growth Initiative (MCGI) today announced the launch of a $1 million targeted radio campaign educating voters in 49 congressional districts nationwide about the benefits of the pro-growth reforms outlined in the Tax Cuts and Jobs Act.